Foreign visitors often ask us the following question: which sailing yacht cruise route would you recommend that has the most impressive range of sites, but is also as compact as possible in terms of time?  An elegant reply to this question would be to take a 3.5-4 hour long cruise on a sailing yacht from Central Riga to one of Jurmala’s yacht clubs on the Lielupe. This route will enable you to enjoy a full spectrum of landscapes ranging from the industrial “romance” of the Port of Riga to the scenic shores of the Lielupe Estuary, encompassed by pine forests and fens. 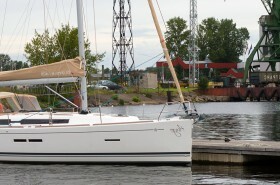 We will board the sailing yacht in Central Riga – at either Andrejosta or the Kipsala Yacht Club and cruise towards the bracing winds and broad expanses of the Gulf of Riga. During the 90 minutes cruise to the sea, you will have the chance to savour the rugged charms of the Riga Commercial Port with its motley array of cranes, containers, ships, coal and log piles, as well as fuel tanks. If port views are not your cup of tea when it comes to landscapes, then this is the perfect time to open your hamper to tuck into your delicious snacks and uncork a bottle of bubbly. 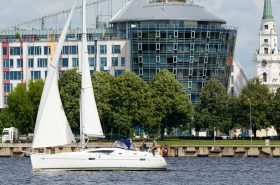 The rich industrial landscape and typical port noises you will experience as you cruise along this section of the Daugava, stretching for about 14 km, will leave you in no doubt that you are now at the heart of the country’s economy. Depending on the wind direction, your senses will occasionally be greeted by the inimitable aromas of petrol and other chemicals that give the port its authentic character. It will only be as you close in on the Daugavgriva breakwaters that your eyes will finally espy more natural and lonely shores, followed by the Daugava’s breakwaters and the Daugavgriva Lighthouse that is often called into action. 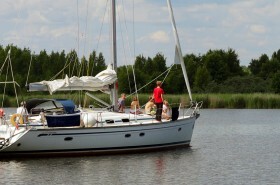 Upon reaching the Gulf of Riga, we can now bask in the magic of sailing in all its glory. Along the Daugava, the wind usually picks up pace and becomes almost tunnel-like as it blows longitudinally, either at your back or into your face. 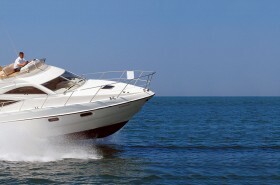 Ideally, if we’ve had the wind at our back on the outward journey, we’ll cruise home propelled by our engine. 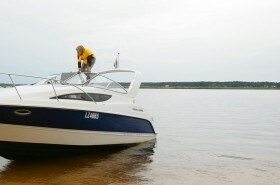 For your final destination, you have a choice of two jetties on the Lielupe at Jurmala. 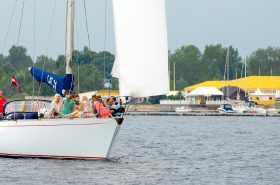 Like the Daugava, the Lielupe can be sailed by yacht from the point where the estuary flows into the sea to the nearest bridge. On the Lielupe, this is a railway bridge before which the Latvian Yacht Club is located. 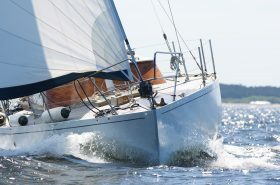 Depending on the wind conditions, it will take you about 40 minutes to sail 3.8 nautical miles to reach it. A second jetty on the Lielupe that is suitable for yachts is in Bulluciems, just a 20 minute cruise from the Lielupe Estuary. The banks of the Lielupe are natural formed along their entire length. The right bank is steep and overgrown with forests, whereas the left bank is lined with broad fens. Both banks are dotted with luxurious and more humble private houses. Halfway between the Lielupe Yacht Club and the point where the estuary flows into the sea, the Lielupe’s scenic White Dune rises up on the right bank of the river and offers both children and grown-ups the thrill of sliding down the sand dune on the seat of their pants. Those who climb to the summit of the dune will be rewarded with an unforgettable view of the entire Lielupe Estuary. If you wish, you can also stop here to take a swim and do some sunbathing. 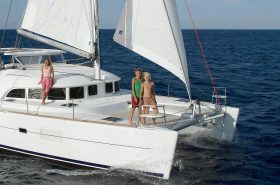 Such is the depth of the riverbed that it can safely be negotiated by quite large yachts with draughts up to 2.5 metres. The Lielupe provides a great study in contrasts. The nudist beach on the Jurmala side of the Lielupe Estuary is juxtaposed with the popular angling spots on the opposite shore at Vakarbulli. If you feel the inclination to do so, you can ask the captain to take you on a detour along the Lielupe’s picturesque tributaries, which are dotted with water bird nesting sites and will take you past the pleasant village that was once home to a giant of fish processing in the form of the “Juraslicis” fish farm. You can also get just as much enjoyment by taking this same route in the opposite direction, that is, from Jurmala to Central Riga.